Before summer comes to an end it is only right to fire up the grill one last time. Of course you can make burgers and grill some nice steaks but what about dessert? Grill recipes are not limited to copious amounts of meat. The grill can be used to make light, bright fruit desserts. One that is high on the list of grill recipes is the grilled peach pie with dark chocolate drizzle. It is one of those fruit desserts with depth and complexity that still maintains its simplicity. The best part is, making this peach pie is a cinch! 1. Combine flour and sugar in a large bowl. 2. Cut the butter and shortening into the flour until pea sized crumbles form. 3. Add the chilled water one tablespoon at a time until a ball of dough forms. 4. Cover with plastic and chill in the fridge for at least an hour. 5. Since this is a grill recipe, fire up your grill or grill pan over medium heat. 6. Lightly brush the peach halves with oil. 7. Place peach halves cut side down for a few minutes or until nice grill marks form. 8. Remove the skin of the peaches and slice. 9. Add sliced peaches and any juices to a bowl along with the brown sugar, cornstarch, cinnamon, vanilla extract and lemon juice (all fruit desserts need a little acidity). 10. Preheat oven to 350 degrees F.
11. Roll out the dough in two 12 inch circles. 12. 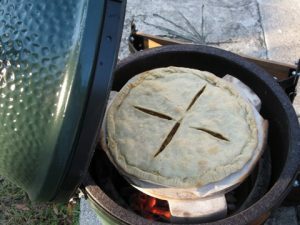 Lightly coat a 9 inch pie pan with cooking spray and add the bottom crust. 13. Add the filling, Place the top crust over the filling, pinch the edges to seal and make a few slits on the top. 14. Brush with melted butter. 15. Bake for 30-35 minutes or until golden brown. 16. Melt the dark chocolate in a microwave safe bowl. Heat for 15-30 seconds at a time, check and stir. 17. Drizzle with dark chocolate. This pie is definitely on top of the list of grill recipes. Who knew that grilling and baking combine to create one very special dessert? The crust is incredibly flaky, the filling is sweet with that lovely grilled flavor with the dark chocolate adds bitterness for balance.